Alessi Farro, known as the "Mother of all wheat" was so important to the Roman legion that it was sometimes used as currency. This ancient Mediterranean whole grain was and is still a staple food prized not only for its taste but also for its nutritional value. High in protein and fiber, it is very easy to digest and can be enjoyed in a number of ways. 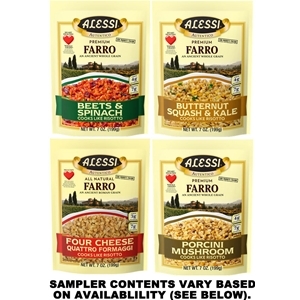 With this sampler you can try each of the Farro's Alessi has created. NOTE: this sampler will only include the items that are currently in stock and may vary from what is pictured (see price and contents below).